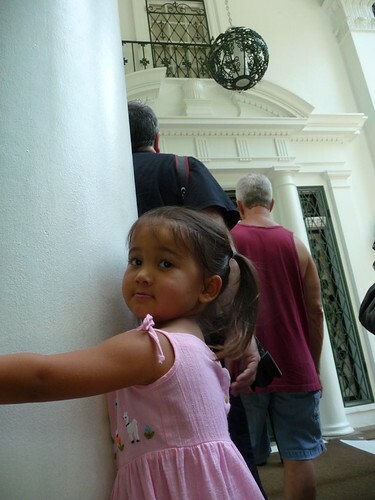 Mali Mish – Day 99: Graceland. Last night we made it to Memphis, Tennessee from a couple nights in Nashville. It was a long drive and the terrain is definitely getting flatter and less scenic as we continue to head west and away from middle Tennessee. 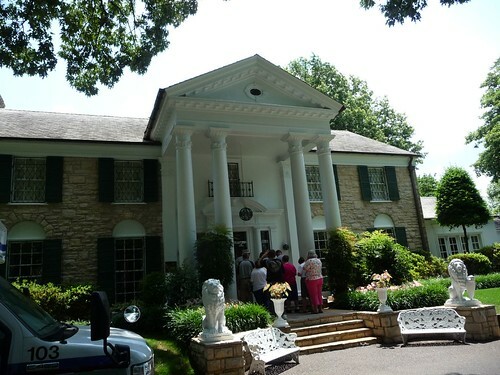 When you are in Memphis, if you have to visit one place, it would have to be Graceland. Regardless if you are an Elvis fan or not, you have to appreciate his contribution and influence to the world of music and how it has essentially shaped everyone who has come after him. 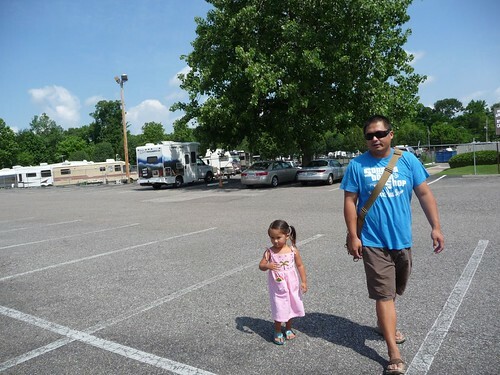 Staying at the Graceland RV Park means we are only a short walk across the parking lot from the Rock and Roll Kingdom. 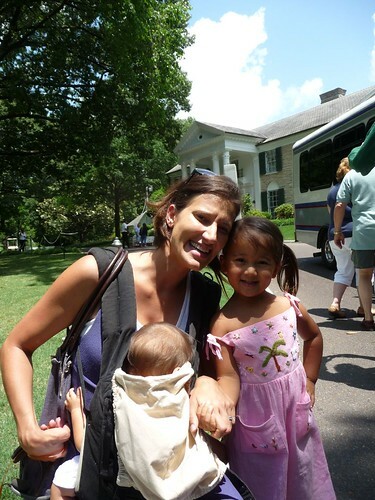 It was a boiling day here in western Tennessee so we got up, got ready and headed out. Before it got too hot and heavy with everything Elvis, we grabbed a quick bite to eat at the Rock and Roll Cafe. 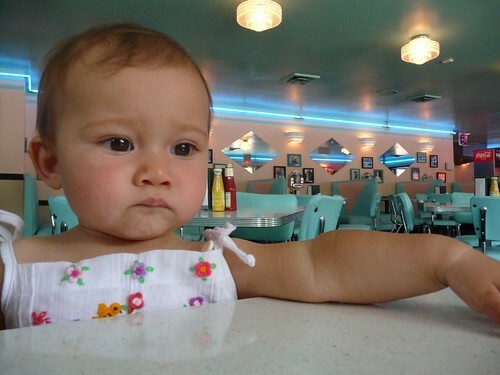 Of course it is a 1950’s themed diner dedicated to the era when the King rose to stardom. The visitors center for Graceland is actually across the street from Graceland. 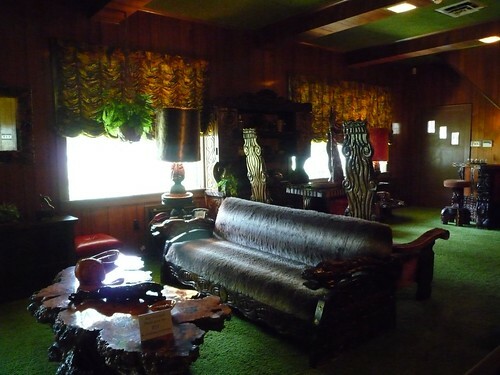 I don’t know if the property was always owned by the Presley Estate but it may have been purchased in the late 70’s after his death in preparation of turning the home to a tourist attraction. 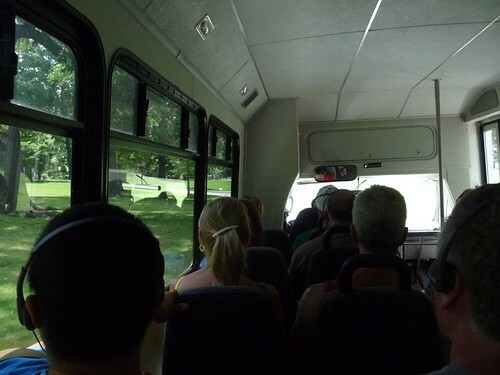 Each tour of Graceland requires the visitors to take the short bus ride across the street through the famous gates of the estate. 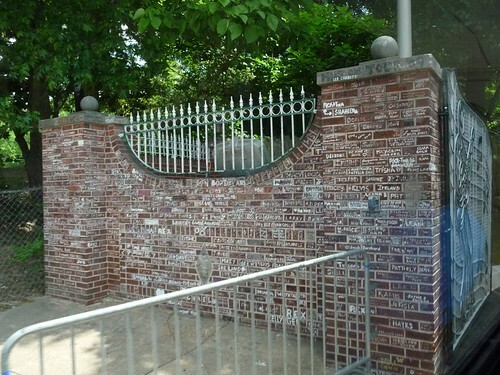 The Graceland gate and brick wall that separates the property from the street is now a living shrine of Elvis fans from around the world. As they regularly inscribe messages on the bricks during their visits to the Rock and Roll Holy Land, the management staff has to diligently remove them in order to keep it clean. After some time, it was clear that these inscriptions were not going to be deterred so they decided to just leave them up. Now only the large vandalism-type graffiti are removed and a regular power wash keeps it looking respectable. Just up the long driveway the bus lets us out as we arrive at the front door. 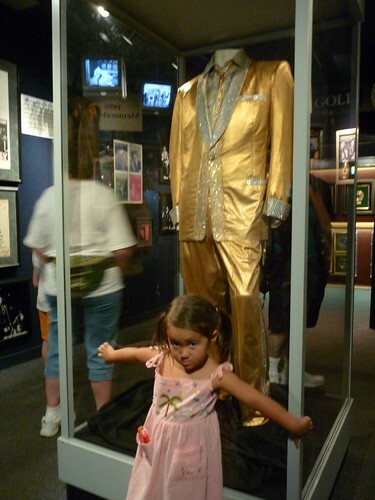 Ava knows that Elvis is her Nona’s all time favorite so that makes him her favorite too. So much so she decided to give Graceland a big hug. Right inside the front door, you get to see the famous double peacock stained glass in the living room. 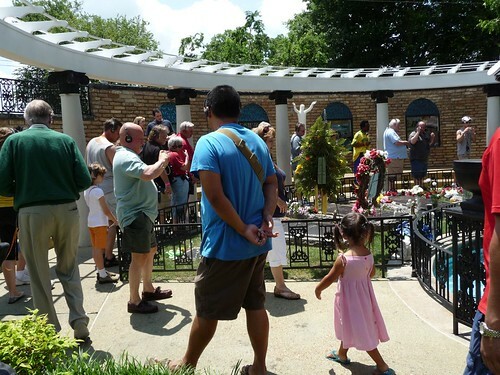 Most of Graceland has been kept just the way it was when Elvis still lived here. That means it sports the state-of-the-art electronics and appliances of its time: The 1970s. 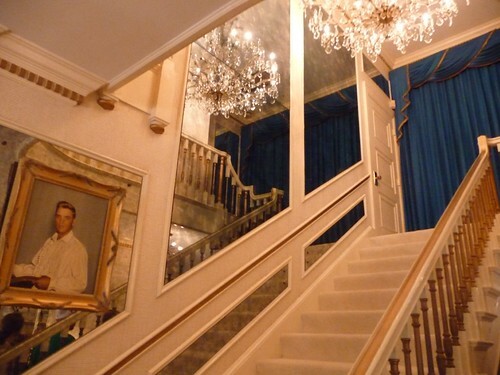 The stairs that lead up to the second floor is not available to visitors being that it was their private quarters. 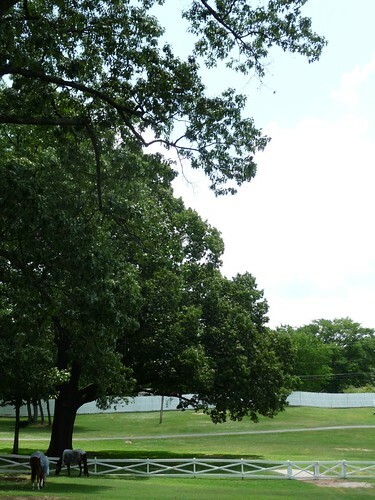 Seems to me that since no one lives here any more, they should open that up for visitors to get a better glimpse of his life here at Graceland. 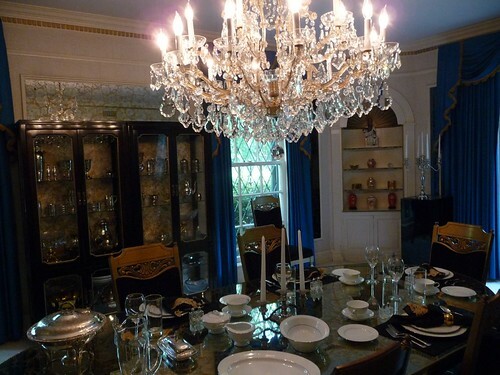 Across from the living room was the formal dining room where Elvis entertained guests and enjoyed many meals with all of the people that have come through here. 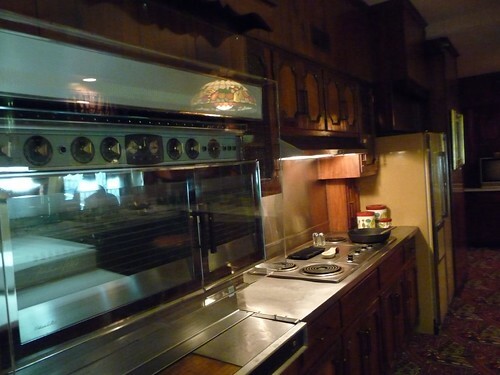 All of that delicious southern-style home cooking that he loves so much came out of this kitchen. Like I said, state-of-the-art appliances from 1970. 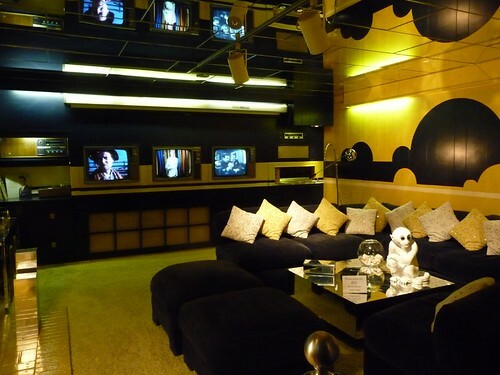 Towards the back of the house was the media room where Elvis relaxed and watch TV. In fact, three of them. This way he could have all three network channels on at the same time. I think he would have liked TiVo. 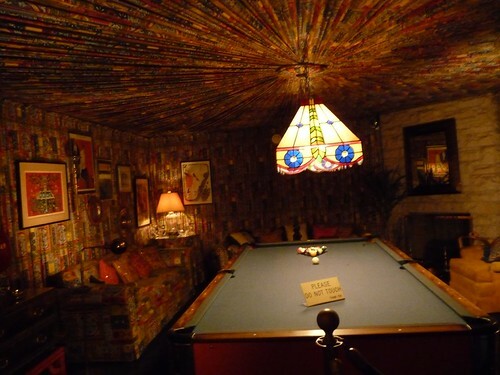 In the pool room you start to see some much more unique decoration with layers of fabric lining the ceiling. Just imagine Elvis here shooting pool with his entourage on a hot Memphis summer afternoon. Here is the jungle room in the rear of the house. 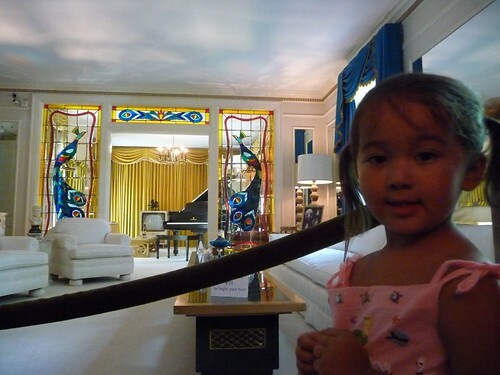 Elvis was very fond of the acoustics in this room and actually used it to record some of his songs here. As we headed out the back door we passed the car port and came up to the garage/office. Right outside of it is a little play set that Lisa Marie used to play at as a kid. 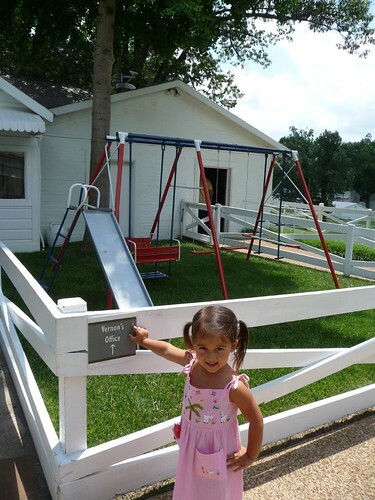 Sorry Ava, I don’t think they are gonna let you play in it. 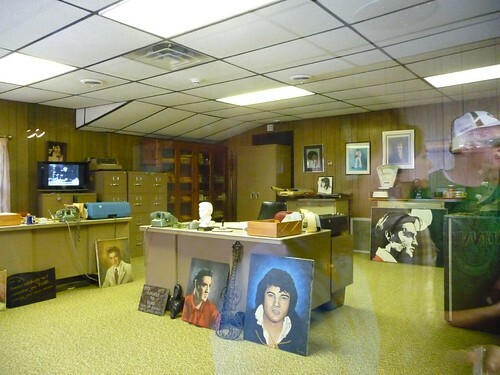 The garage is a converted office where Elvis’ father Vernon managed his career. Once again, it houses some of the best business machines money can buy in 1970. If you need a conversion of this type, best garage door repair company I know of is ready to help. On the TV in the back is a video loop of Elvis in this exact room hosting a press conference after he returned from his military duties. In the video the reporters grilled him about the ‘girl from Germany’ which he dismissed as just another girl. She just so happened to be named Priscilla. 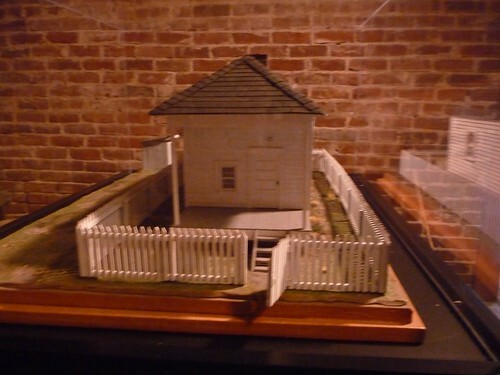 Just adjacent to the office is a storage space where a scaled model of Elvis’ birthplace is on display. He was born just across the border in Mississippi in a town called Tupelo, MS. The small two room shotgun home built by Vernon in anticipation of the birth of their twin boys is where Elvis got his start in this world. I did not know before I came here but Elvis was 1 of 2 identical twins that his mother Gladys had. Unfortunately his older twin brother Jesse was a still born that came 35 minutes before him. 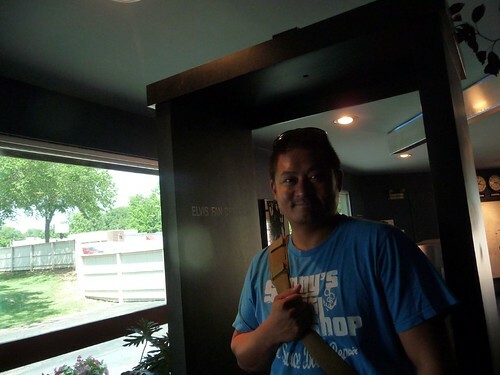 The storage room at one point was made into a shooting range by Elvis and shell casings were littered around the room. 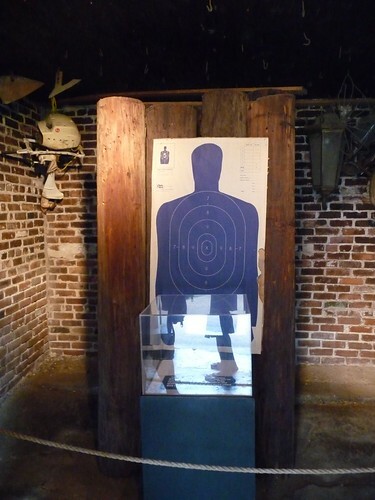 Elvis thought the sturdy brick structure made it ideal for an indoor shooting range. Even if its right next to Lisa Marie’s play set. The 14 acre compound is Elvis’ ultimate playground when he is home. He loved riding horses and driving golf carts on the property and each of his entourage had one of each to hop on when he got the urge to go. They were notorious for their buffoonery at home as well as on the road. It was not uncommon for them to all get on a golf cart and drive down through the main gate of the property and on the city streets while chasing each other. 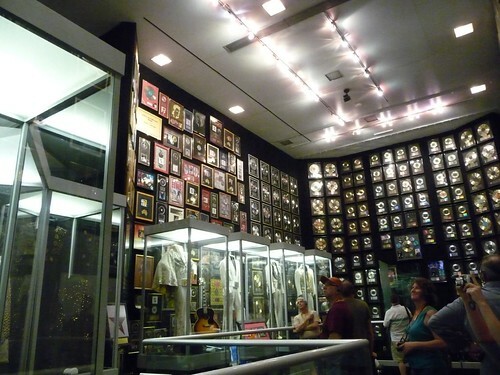 Part of Graceland also houses many of Elvis’ many gold and platinum records. Although records were not the only things that were gold here. One of his many flamboyant stage outfits is on display right at the entrance. 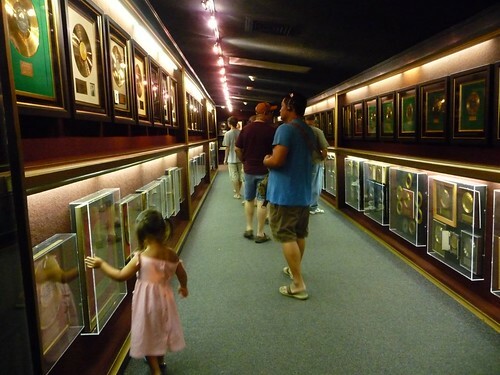 Here we are walking down the Elvis ‘Hall of Records’. 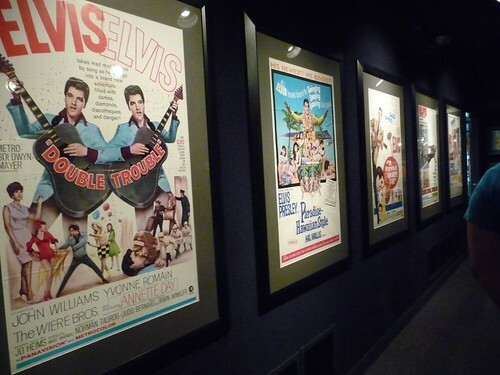 And to one side of the wall, we have posters from the ‘Movie Star Elvis’ era of the 1960s. Elvis took up the sport of racquetball in his later years. 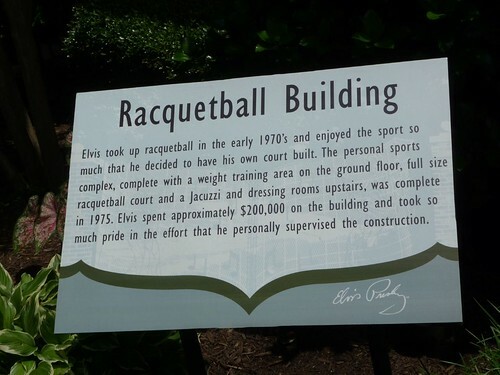 He enjoyed it so much he built his own racquetball court right on Graceland. No racquetball is played here anymore. Where the court once was, it is now holding even more memorabilia from the king himself. 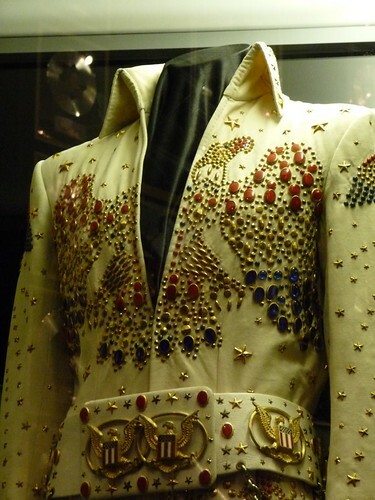 On display here is the famous bedazzled jump suit Elvis wore during the ‘Aloha from Hawaii’ concert from 1973. 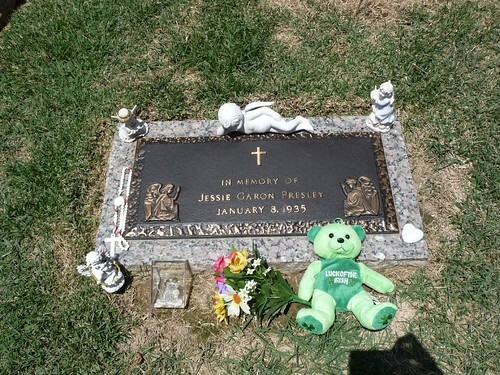 The last thing we visited is the Presley shrine where Elvis and his parents are buried. Aside from Elvis, Vernon and Gladys, his twin brother who was buried in Tupelo, MS back in 1935 also has a headstone here along with the rest of his family. I can’t help but to imagine what it would be like if Elvis had an identical twin brother that survived. 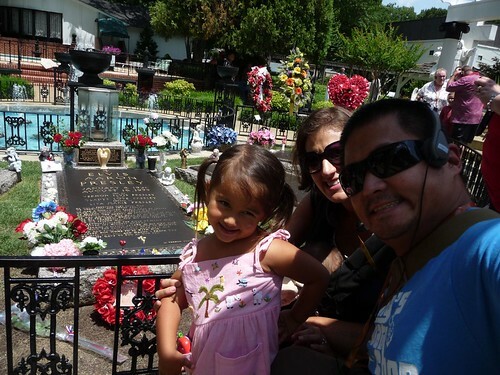 Here we are all smiling at Elvis’ tomb. We are only smiling because we know he is alive and well in the South Pacific, not because we are disrespectful. OK, time to get back on the bus again. The bus driver told us that would have a chance to pose in front of the house before we left. But everyone was in such a hurry that this is the best one we got. 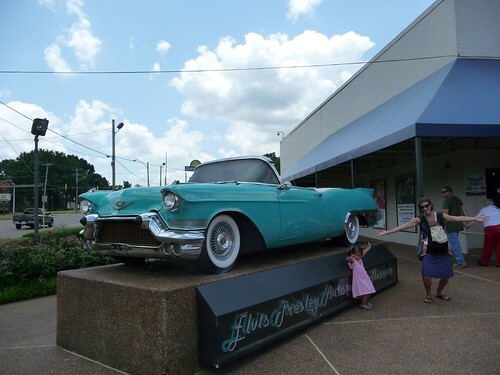 Well, just when you thought that this post is finally over, here we are at the Elvis Presley Auto Museum. Don’t worry, it will be over soon. 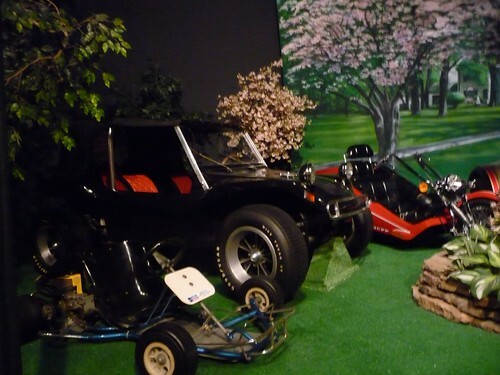 It is no surprise that Elvis was a fan of the motorized vehicles and owned many of them in his life. 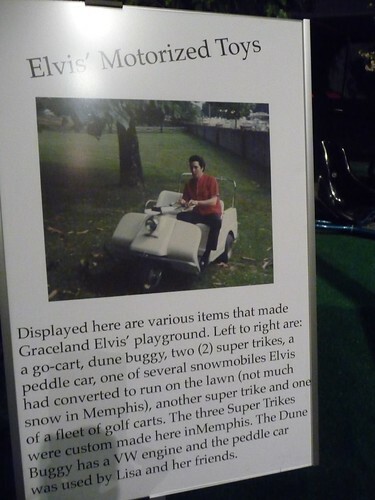 More than fancy cars and motorcycles, Elvis probably had just as much fun riding a variety of off road vehicles on the property of Graceland. Isn’t this much more interesting to look at than a bunch of fancy shmancy Rolls Royces and Cadillacs? Well, OK, just one Cadillac. 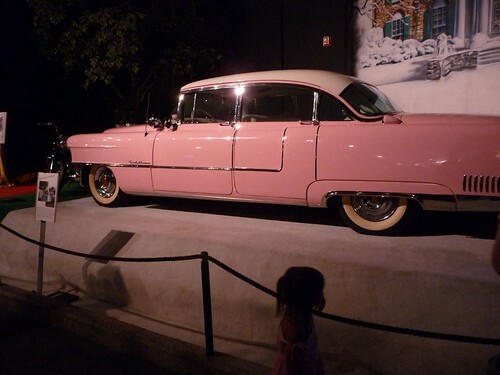 This is the famous Pink Cadillac that Elvis’ mother Gladys loved driving. Elvis had what people said as a ‘abnormally close’ relationship with his mom. It included him calling her by pet names and communicating with ‘baby talk’. 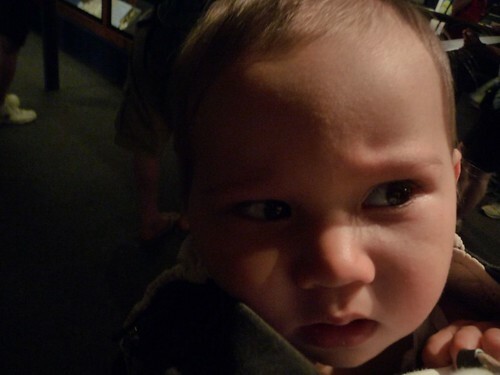 He even slept in the same bed with his mother until he was in his teenage years. The feeling was mutual as when Elvis became successful and was forced to spend more time away from home, Gladys became depressed and started to drink heavily and neglect her health. She passed away while Elvis was serving his military duties at Fort Hood. Another interesting anecdote about Elvis is that many people believed that he had a fear of flying. Many of his early tours he insisted on traveling by land. When he got too popular and it became impossible to make tour dates by land, he was forced to adopt air travel. Being the King, he of course had to have is own plane. In fact, he got 2. And they are both there on display. I got the ‘All Clear’ as I passed the ‘Elvis Fan Detector’ at the terminal. I don’t know if that means I AM a fan or if I AM NOT a fan. 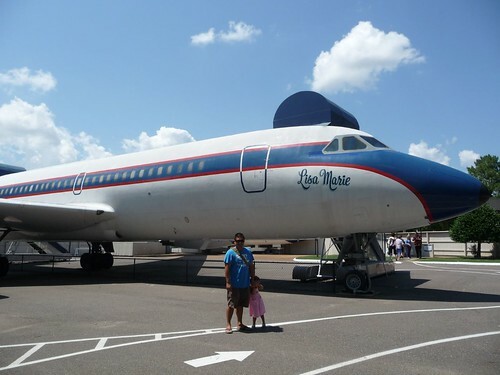 The main jet here is a 4 engine former jetliner Elvis bought for $250,000. To customize it for his use, he dropped another $750,000 to make it an even million. Once again, 1970s technology at its best aboard The Lisa Marie. 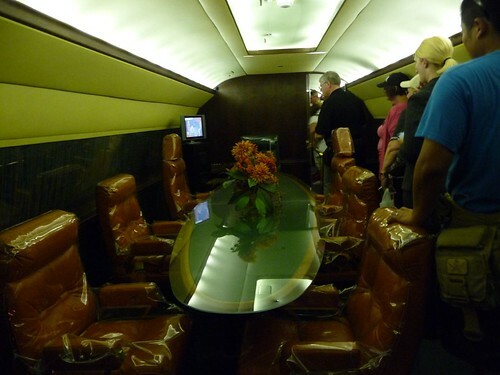 It feels kind of like we are on a tour of the Jimmy Carter Air Force One. 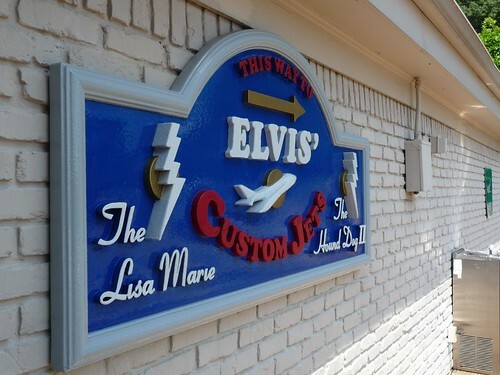 Interestingly enough, The Lisa Marie is also commonly referred to as Hound Dog 1. 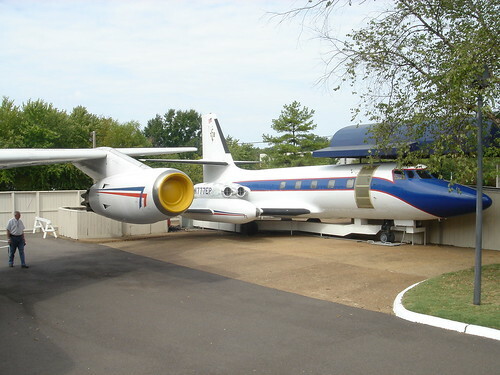 That’s because just next to it, is a smaller jet Elvis also bought named Hound Dog 2. It was used mostly by his tour manager to stay ahead of his schedule so once he arrived, everything would be ready for him. Must be nice. 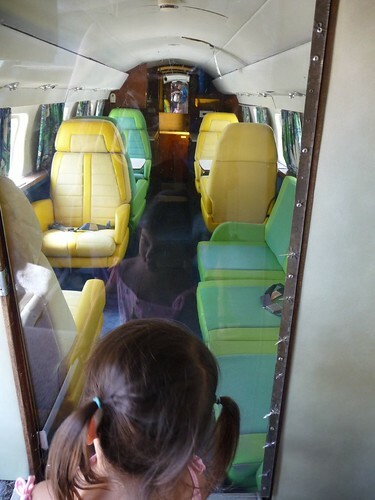 Hound Dog 2 wasn’t quite as luxurious as The Lisa Marie but you know what, it is still a private jet. A ‘spare’ private jet. Phew! That was a lot of Elvis on one day. We didn’t even get to see everything. 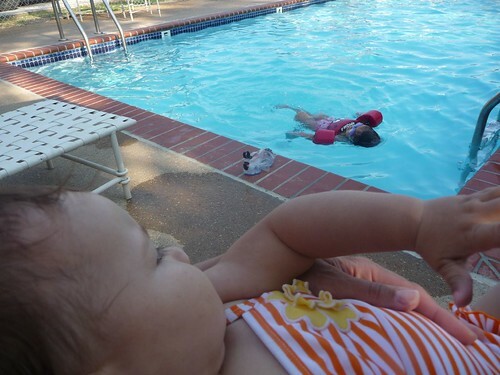 Time to cool off in the pool before the thunderstorms hit. Day 98: On our way to Memphis. One Response to Day 99: Graceland. Great post!! Very informative too!